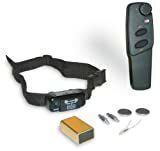 Deluxe Little Dog Bark Collar fits most dogs up to 55 pounds. With NANO-TECHNOLOGY making this the smallest bark collar available. Also has the patented Perfect Bark detection that ensures your dog’s bark is the only sound that will cause the correction. Includes automatic correction level adjustment called Temperament Learning. This software tracks the number of corrections needed to reduce and in most cases eliminate nuisance barking. The Deluxe Little Dog Trainer is a full featured trainer designed for both the professional and the average pet owner. Recommended for dogs under 40 pounds and / or dogs over 15 pounds. Includes a comprehensive training manual. It can be used to deter unwanted behavior such as, chewing on furniture, jumping on guests or digging. Can be used for basic obedience training as well. In Ground Fence for Small Dogs. For use in the US only. This unit is compatible with all US 110v outlets and are not to be used with 220v international voltage.